You’ve heard of a “Crime Scene Investigator (CSI)”? Well, I’m a “Quilt Scene Investigator (QSI)”! 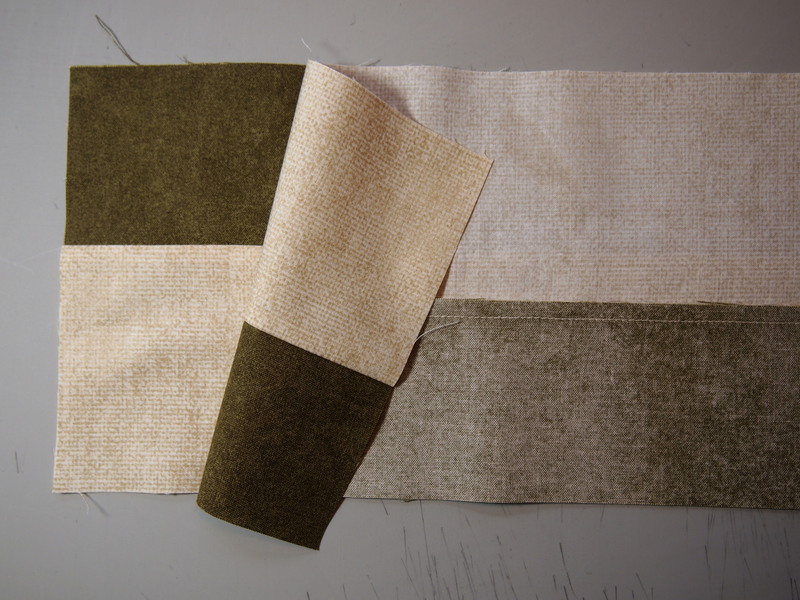 A few weeks ago Sue had written asking about patterns for the Studio 180 Design Split Rects Tool. Ever since, I have been investigating blocks that can use a split rectangle. I found this block in Electric Quilt 7 Block Library. It is called a 9 Patch Star. I used Silver and black Kona cotton. 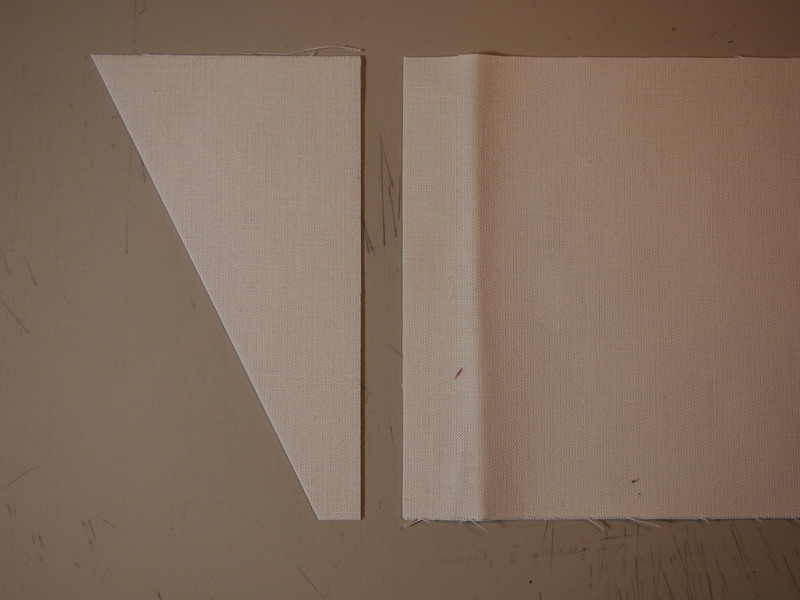 Cut four 4 1/2″ squares of the light fabric for the corners. 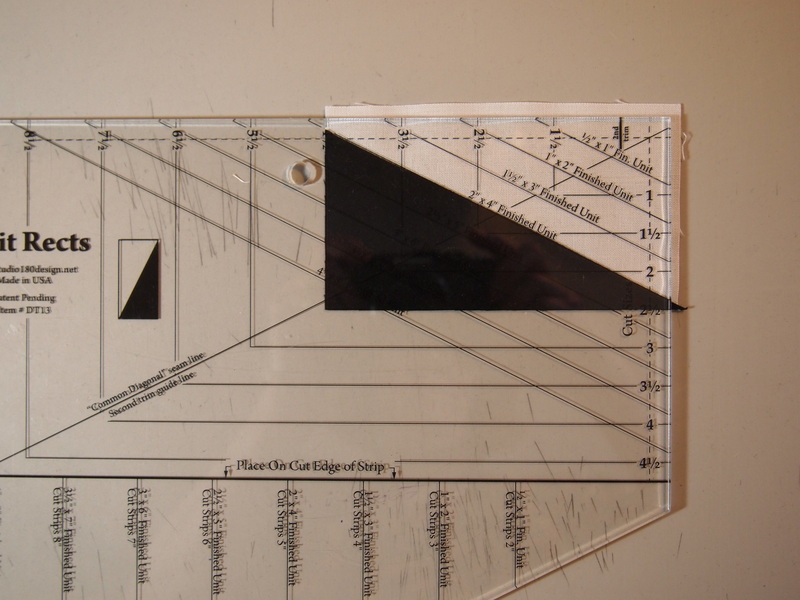 for a 12″ finished block I would need eight 2″ x 4″ finished mirror image split rects. 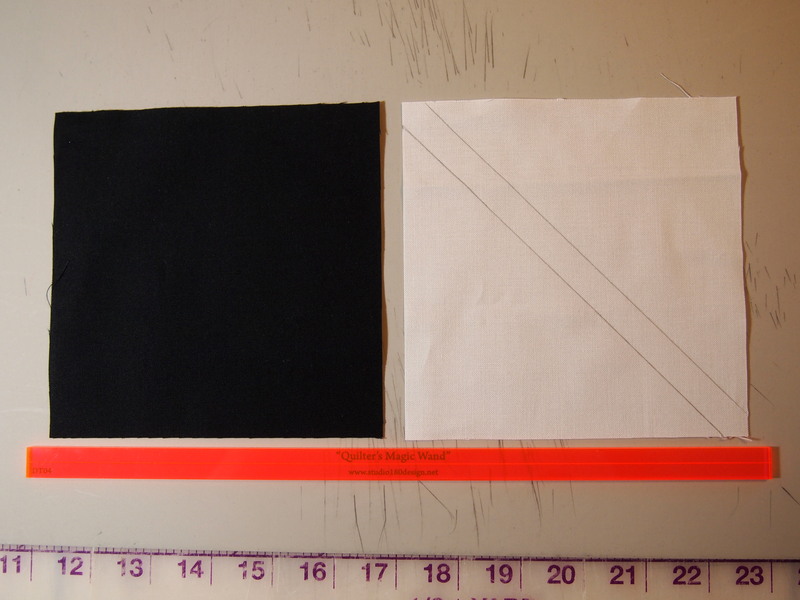 By checking the split rects ruler I know I need to cut one 5″ strip in both light and dark fabric. 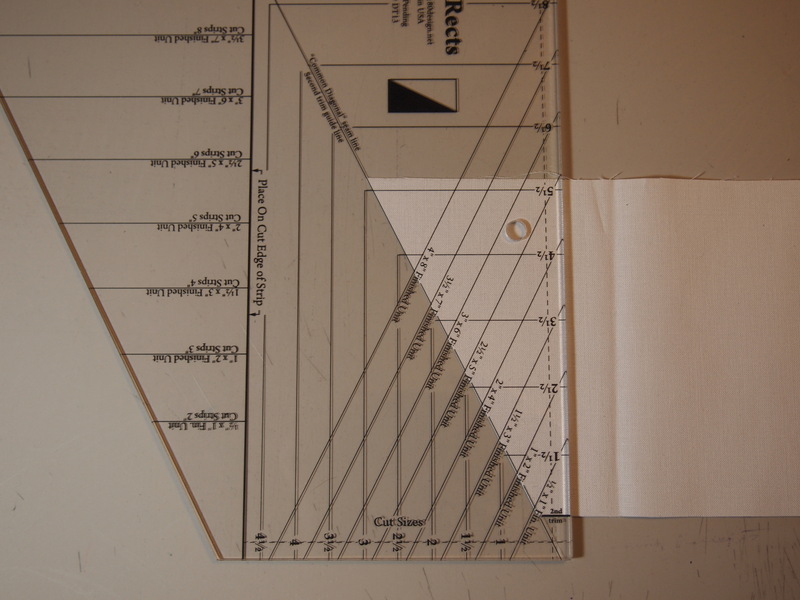 The instruction sheet for the ruler tells me that for mirror image units my fabric strips should be either right sides together or wrong sides together on the cutting mat. 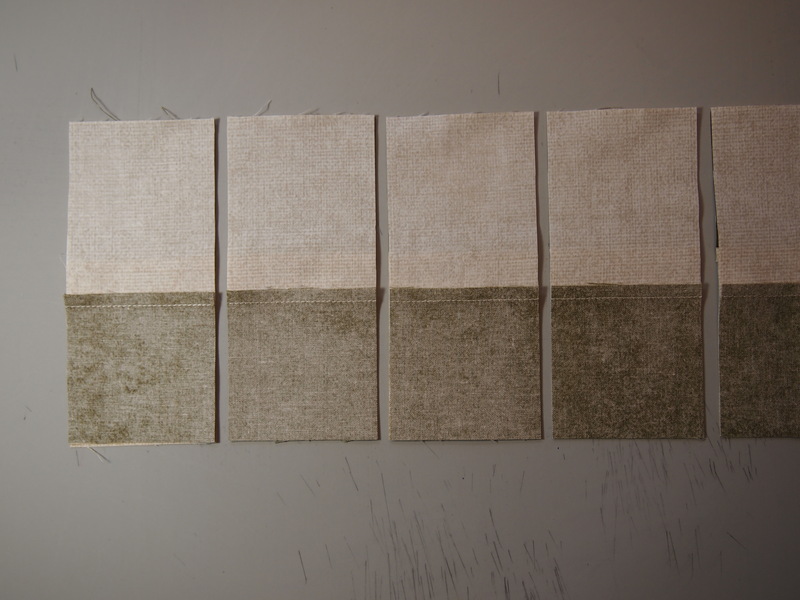 Cut from left to right. 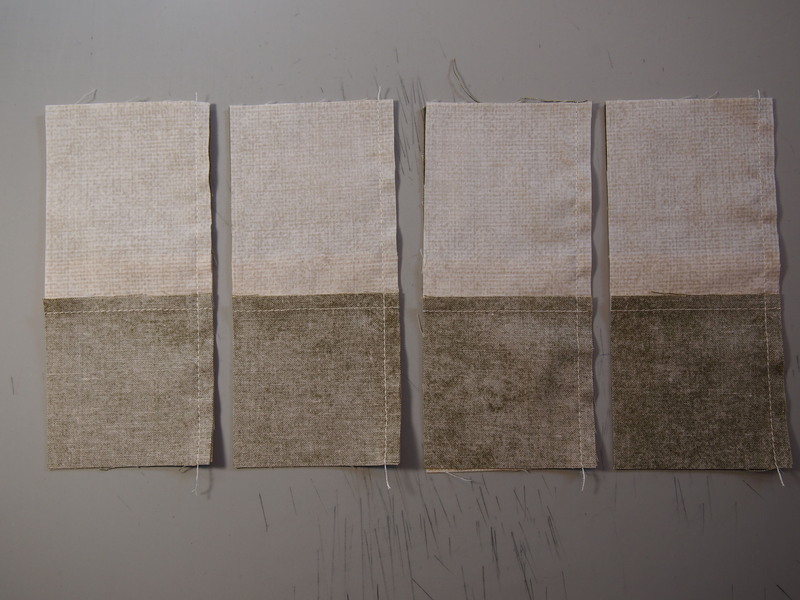 Do this for both color fabric strips. Position and sew the units together. Press toward the dark. Rotate the block and square up the other 2 sides. 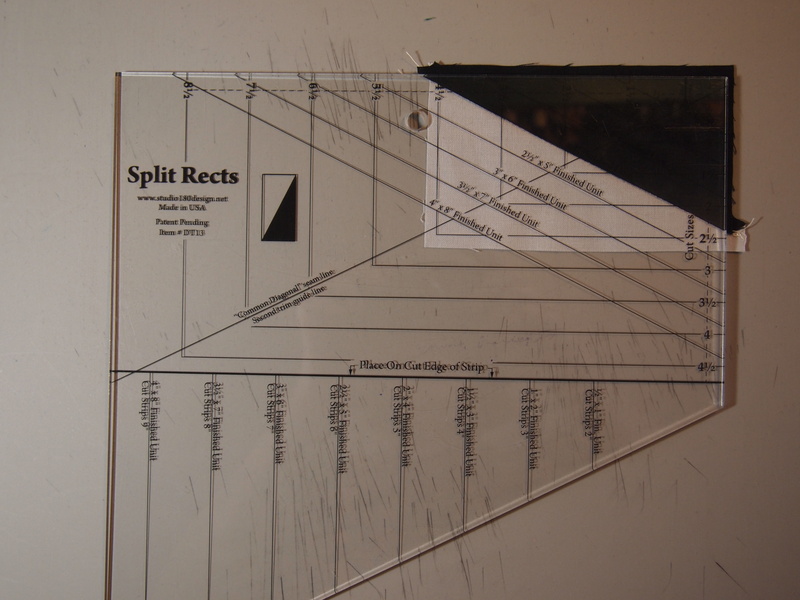 Two mirror image split rects units. Continue until you have 4 sets. Now we are going to make the Hour Glass. Checking the Tucker Trimmer instructions I see that for a 4″ finished unit I start with 5 1/2″ square of both the light and dark fabric. Using my Magic Wand I mark 2 lines on the light square. Position the two squares right sides together. 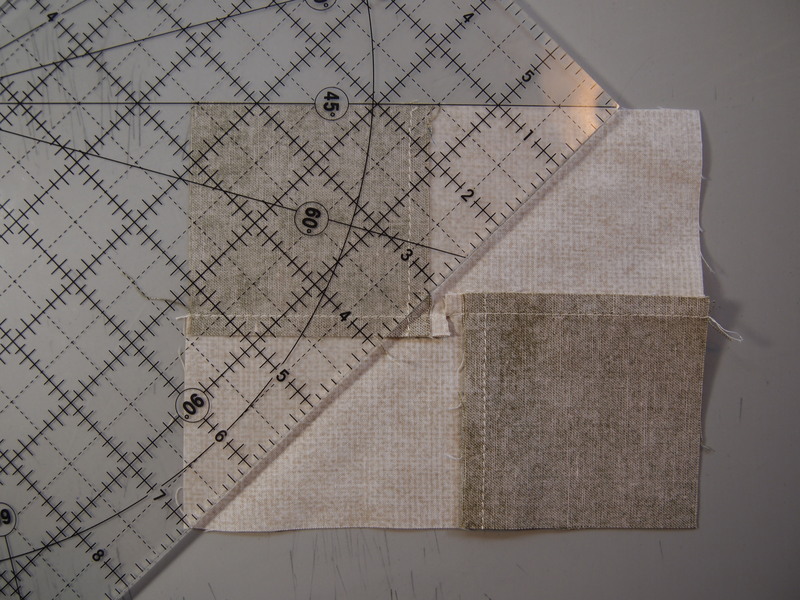 Sew on the marked lines and cut apart and press toward the dark fabric. Position pieced units right sides together and mark two more stitching lines. Sew on the lines, cut apart and press seams open. Square up using your Tucker Trimmer. 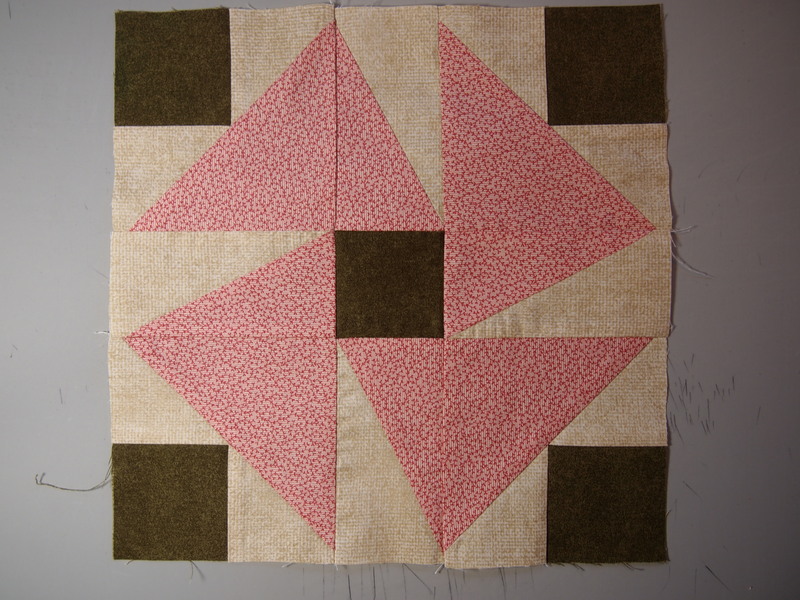 Sew the units into rows and then join the rows into the block. I love this block. 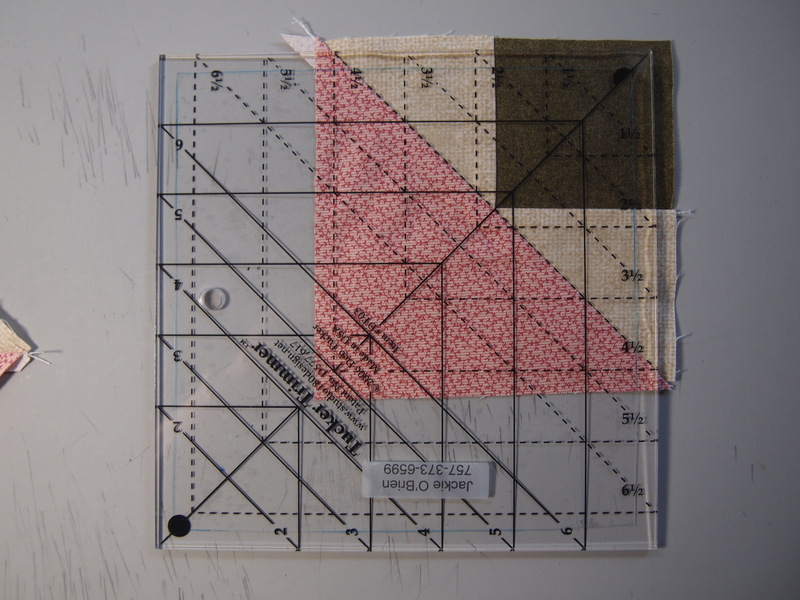 My friend and fellow Studio 180 Design Instructor, Connie Farland, shared this block with me. This is 10″ block. It uses Shaded 4 Patch units and Split Rects units. 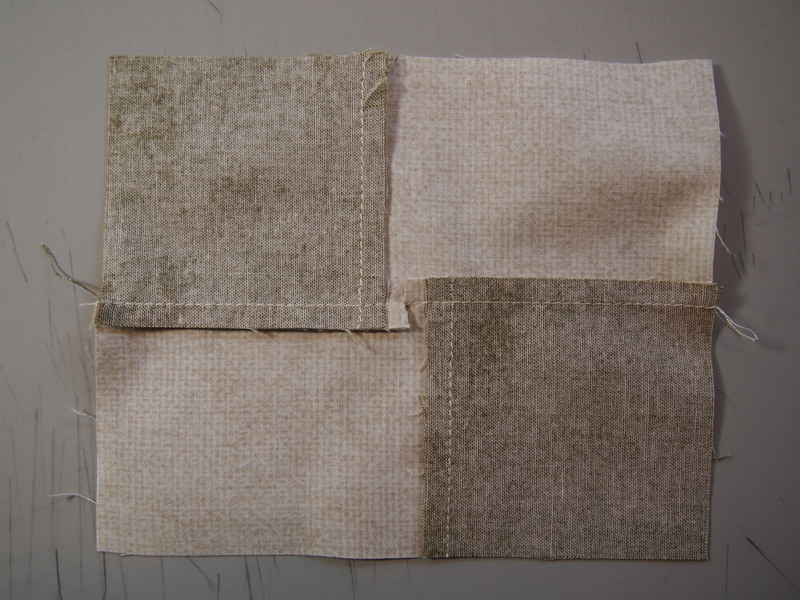 If you don’t have the Shaded 4 Patch Technique Sheet, you will want to get it. It is a great source of information. 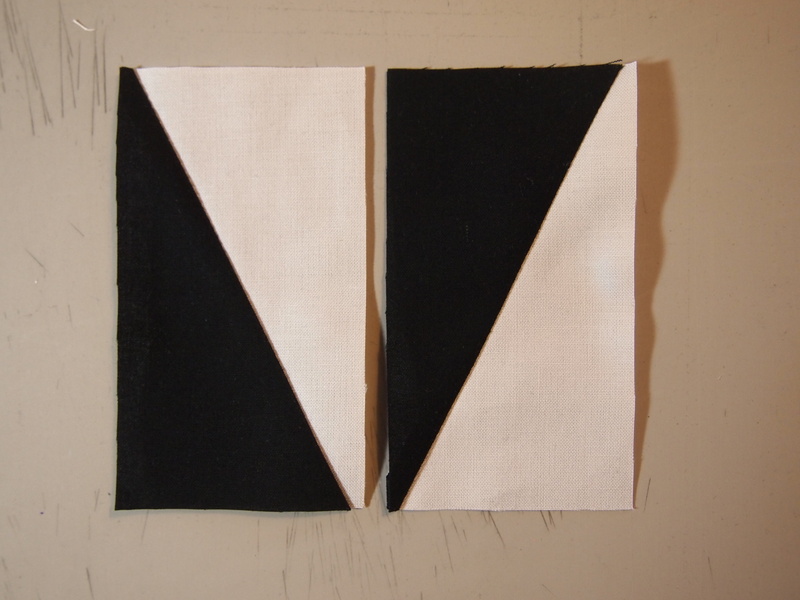 It tells you everything you need to make from 2″ to 12″ shaded 4 patch units by strip piecing! 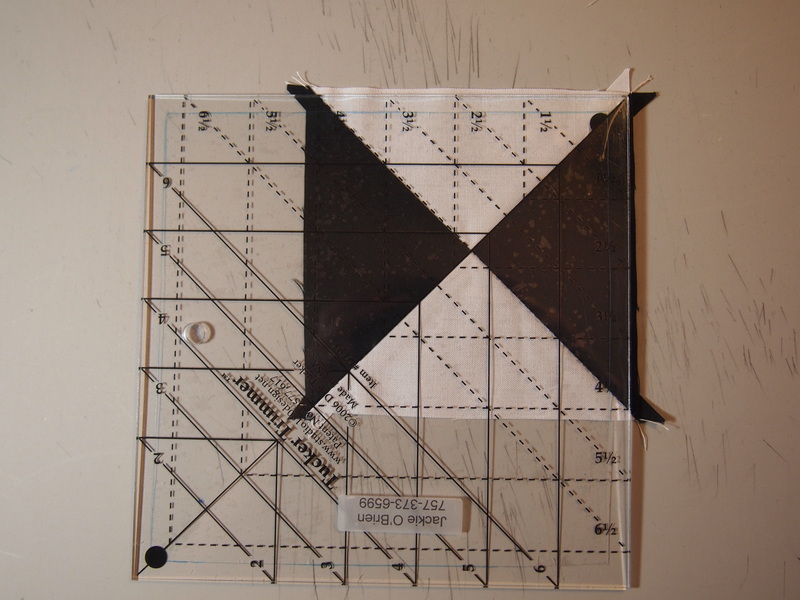 I decided to make a 10″ block so I check the chart on the Shaded 4 Patch Technique Sheet. 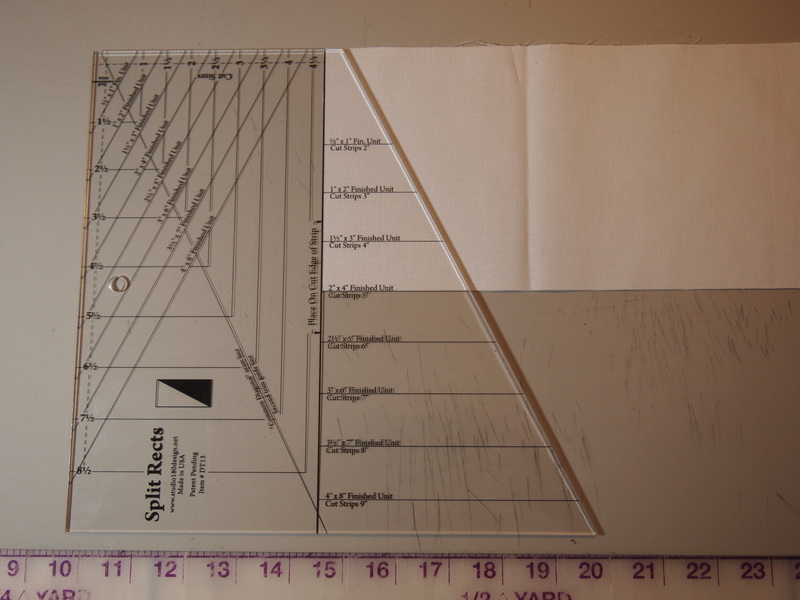 Cut two 2 3/4″ (narrow) strips, two 3 3/4″ strips (for color placement the wide strip is where the 2 small rectangles come from) and one 5″ strip that is sub-cut into 5″x6″ rectangles (for color placement, this is where the large triangle comes from). 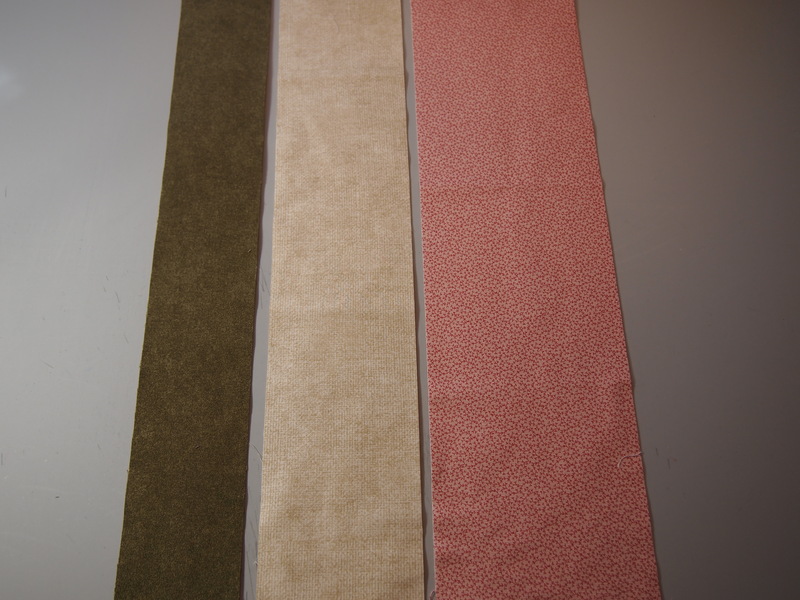 Take one narrow and one wide strip right sides together and sew them together along one long side. repeat with the other strips and press toward the wide strip. 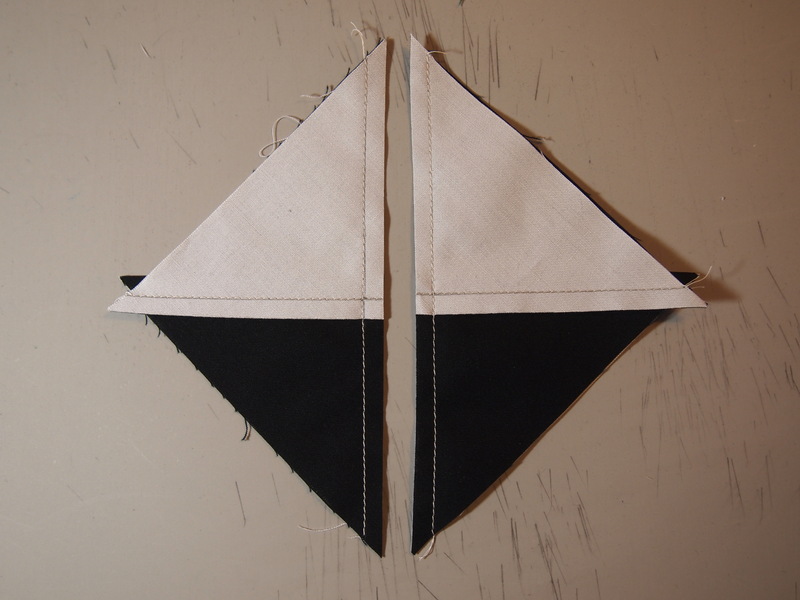 As shown above, pair two of the pieced strips right side together with the narrow strips on opposite sides. 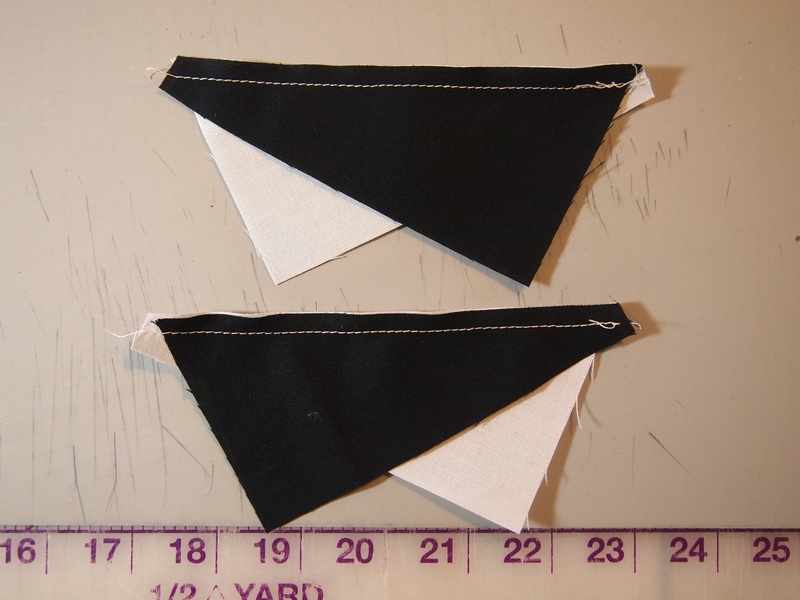 I cut my units the same size as my narrow strip: 2 3/4″ wide. 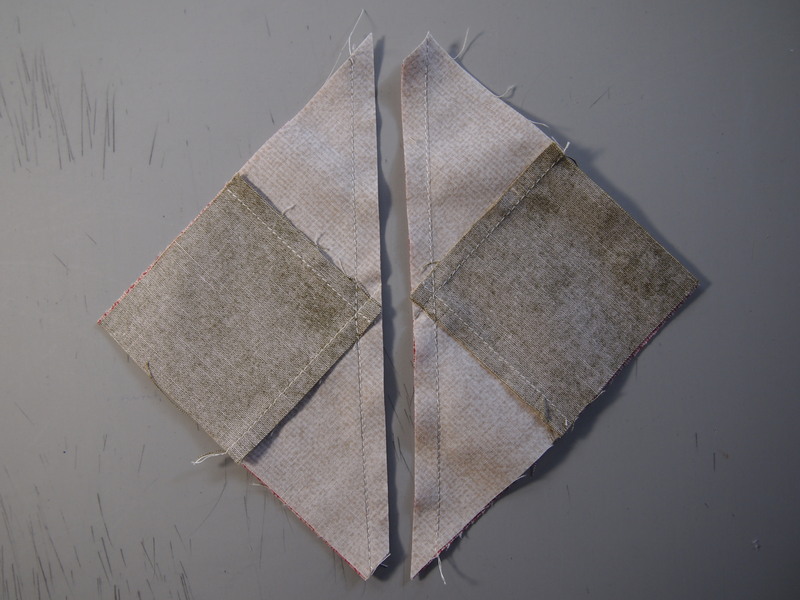 Stitch each pair of cut pieces together along one long side. 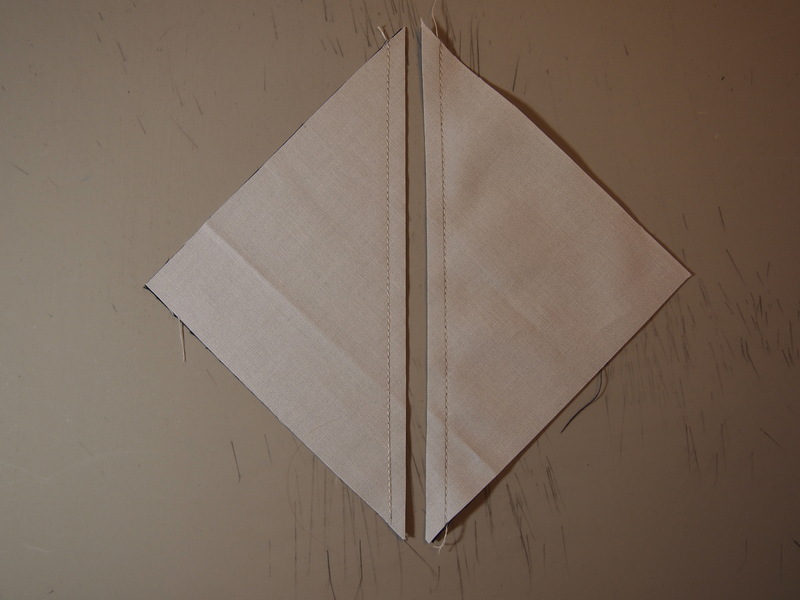 Snip the seam allowance at the halfway mark between the two squares all the way to the seam. 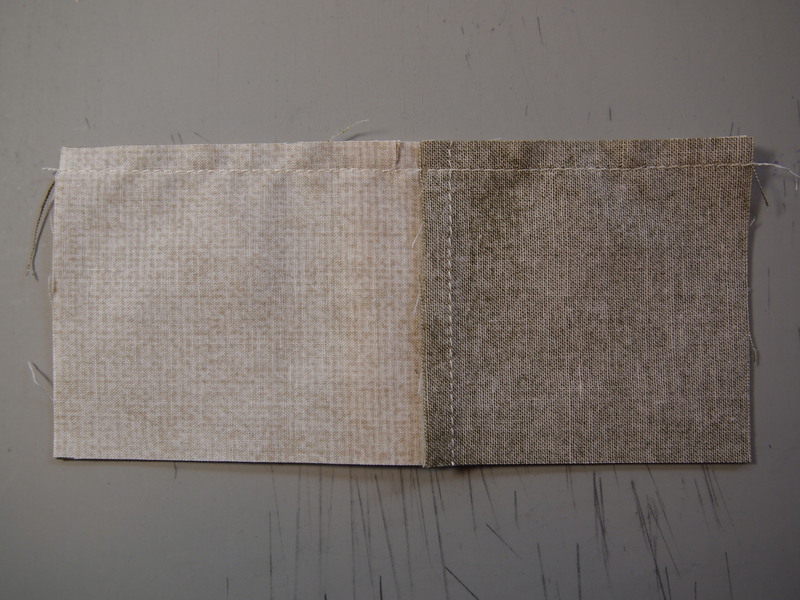 This allows you to press each half of the seam allowance away from the square. 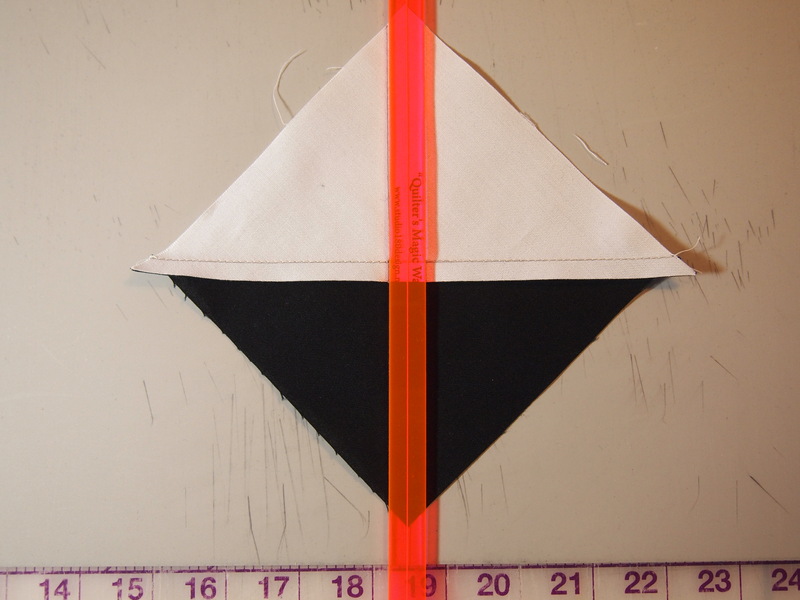 Using a ruler with a 45 degree line draw a sewing line from top to bottom, through the corner of the square where the stitching lines meet. Draw a second line through the other square. Center each marked unit over a large rectangle, right sides together. 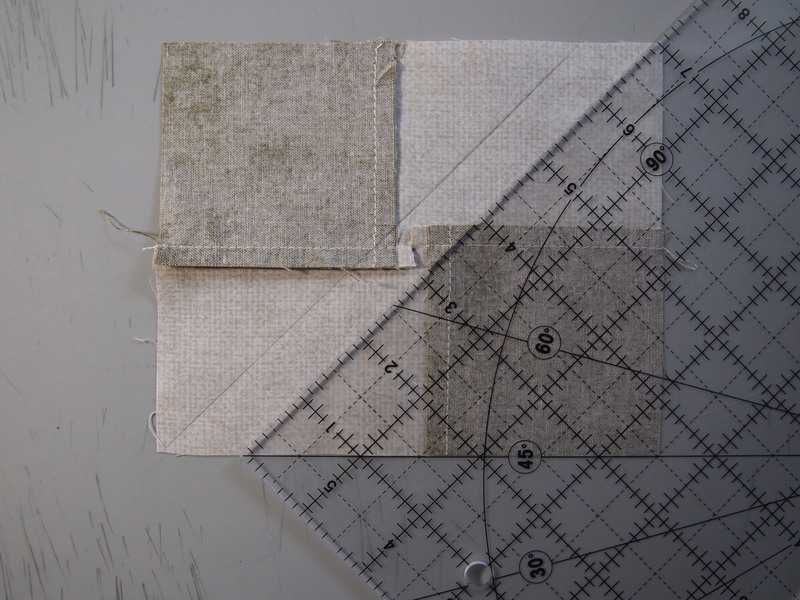 Sew on the marked lines and cut apart. Press toward the large triangle. Refer to your split rect instructions. The split rects for this block are not mirror images. 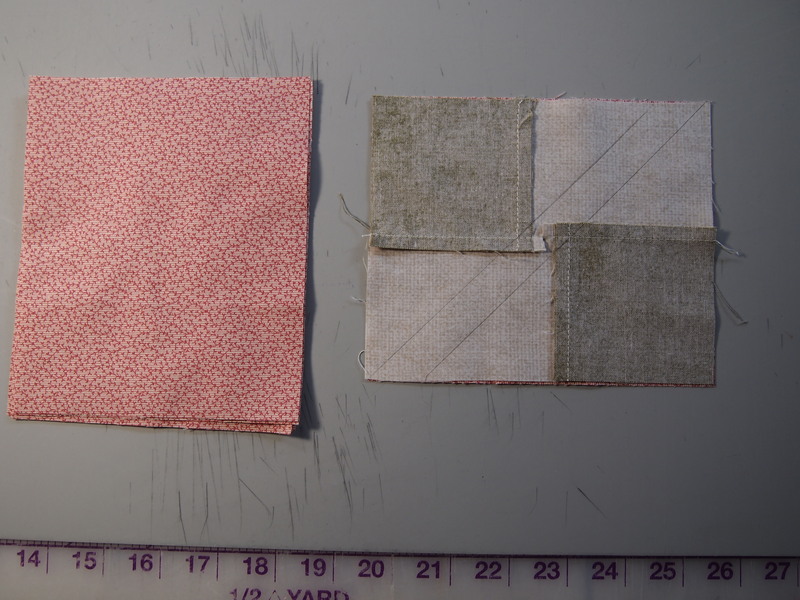 For these, all fabric strips should be right side up to cut the rectangles. This block requires four 2″x4″finished Split Rects. 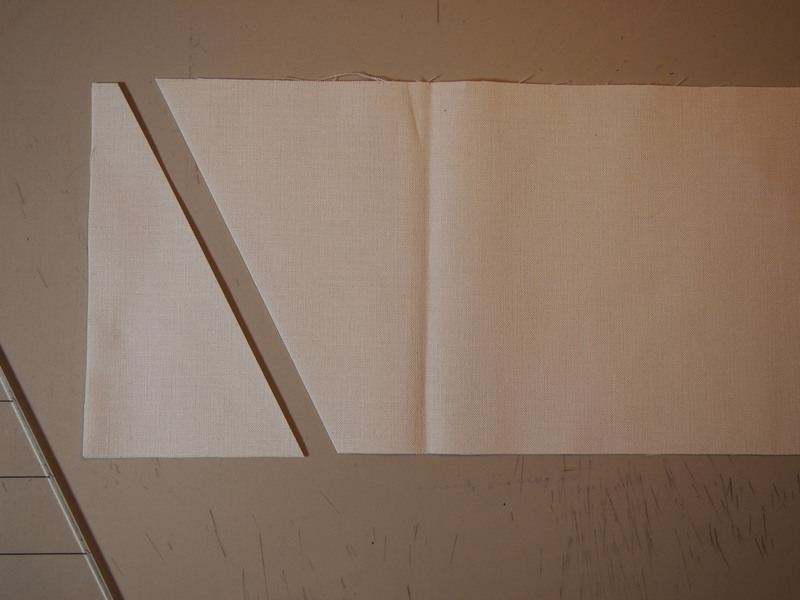 Cut one 2 1/2″ square for the center. 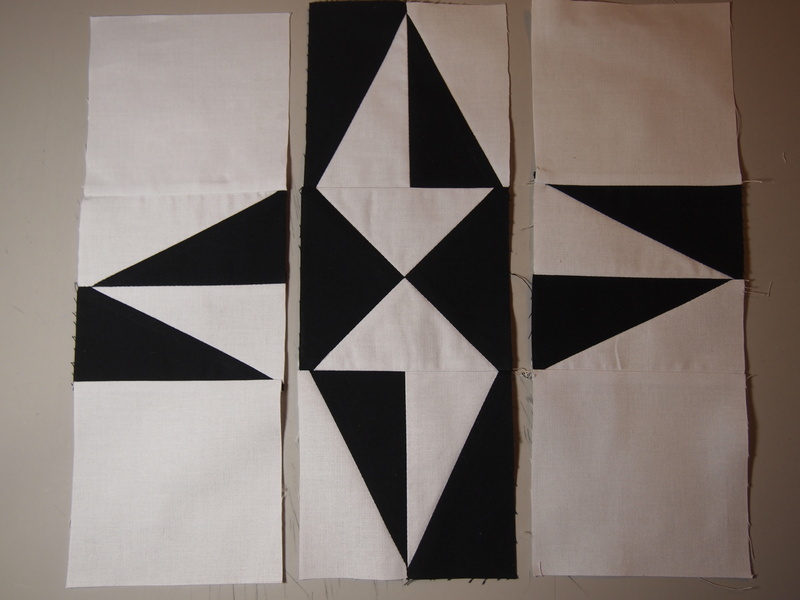 Layout your units, sew into rows and join the rows in a finished block. 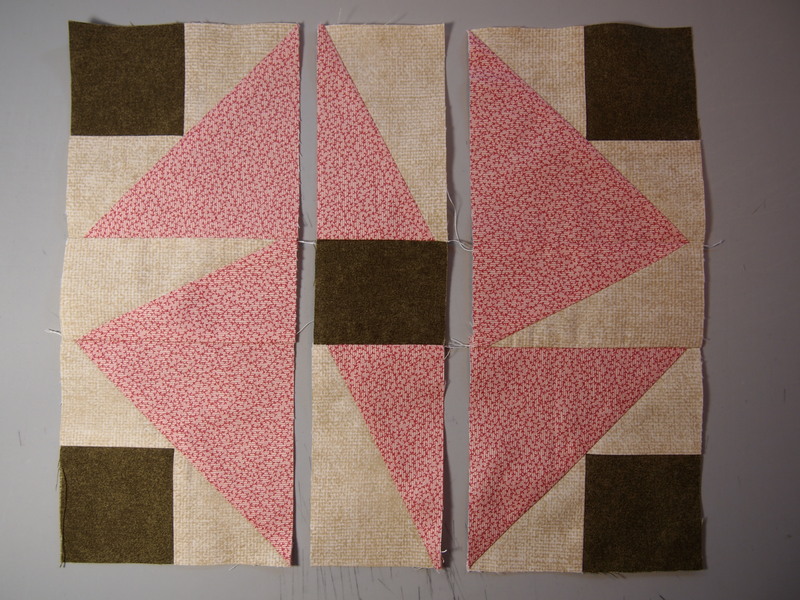 Two Great Blocks using the Split Rects Ruler. 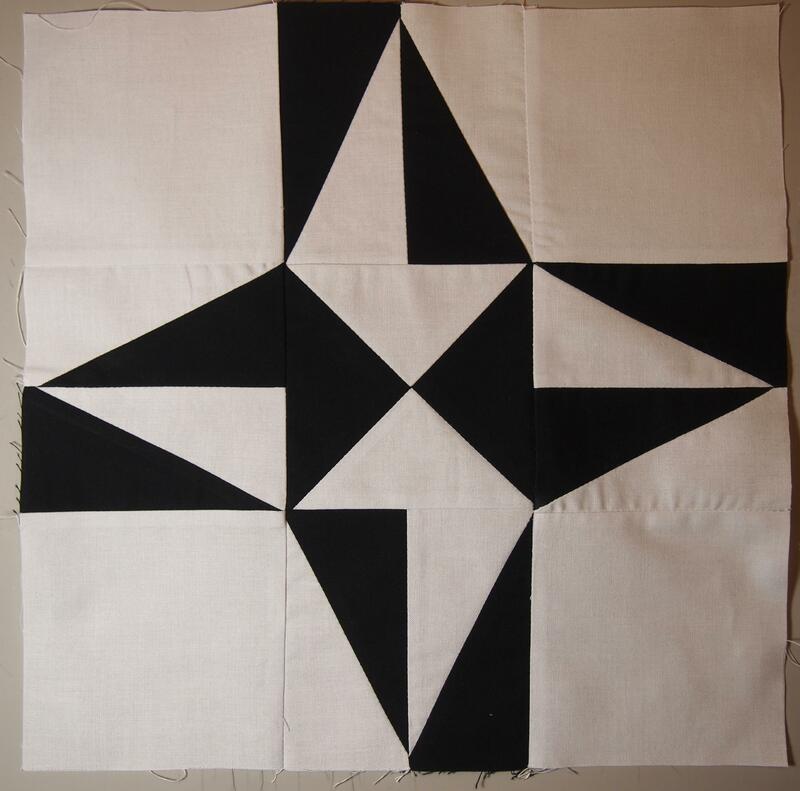 This entry was posted in Split Rects and tagged Deb Tucker, quilting, Quilts, Shaded 4 Patch, Split Rects, Studio 180 Design, Tucker Trimmer on January 22, 2014 by ifthesethreadscouldtalk. Love your block and I REALLY LOVE QSI!!!!!!!!! Thanks Connie. I really loved the block you shared with me. Sue wrote that she loved it also. Can’t wait for our reunion in March!!! Also, I’m loving your sewing space! Great, I’m glad you like them. I like them too! Did see the other one I posted last week?